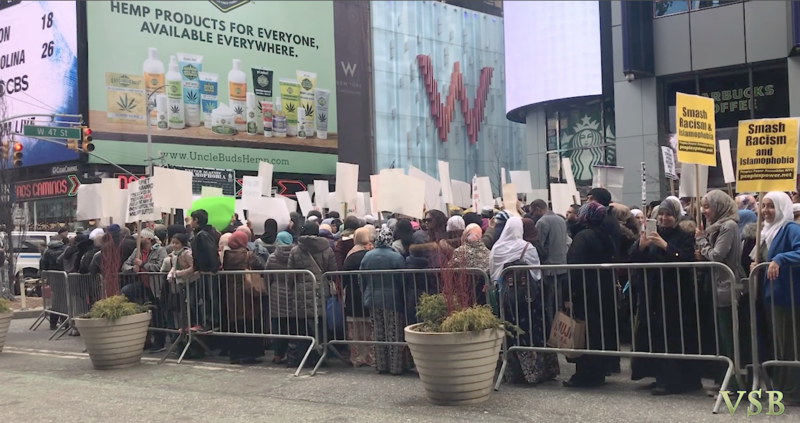 After covering the poorly attended Kirsten Gillibrand’s “I’m running for President” Rally, I headed to Times Square (47th St and Broadway) and the very predictable CAIR “Rally Against ISLAMOPHOBIA.” This too was not the attendance expected, but definitely better than Gillibrand’s big fail. 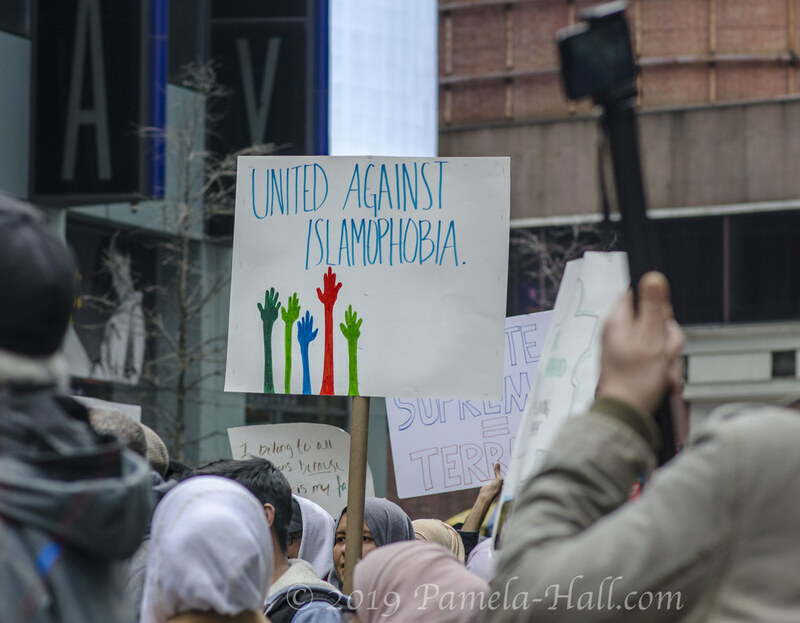 The Muslim signs, and the speeches, were laden with Hate, Racism and Victim Mania. Pretending to be anything but what they actually were: racists masquerading as victims. 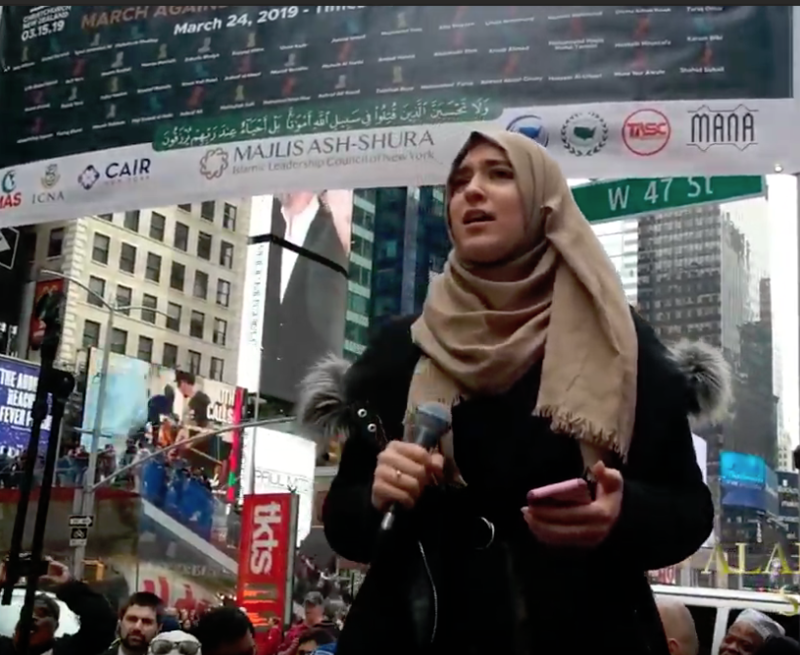 The big lie of the day: CAIR is LOVE. 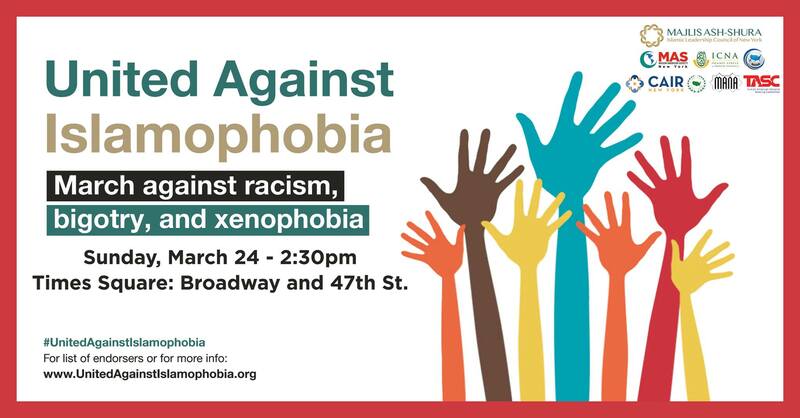 White America is HATE! 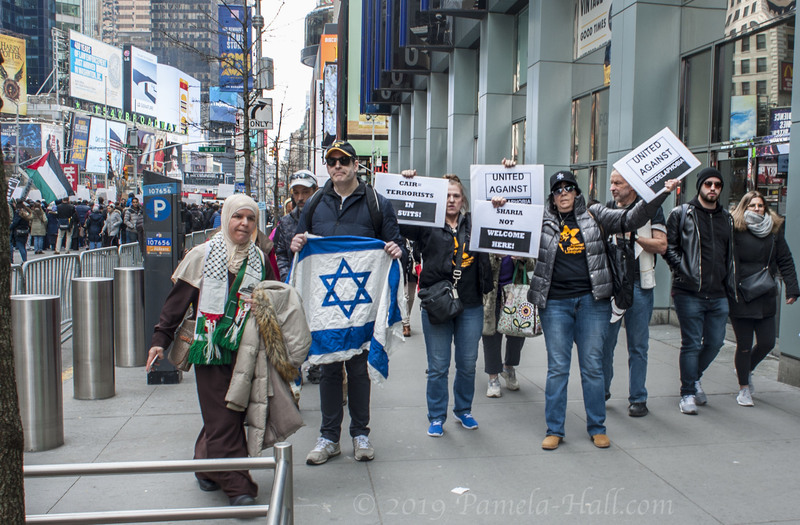 Once again they claimed that the people gathering at AIPAC (the American Israel Public Affairs Committee) represented the worst in humanity, not the best. 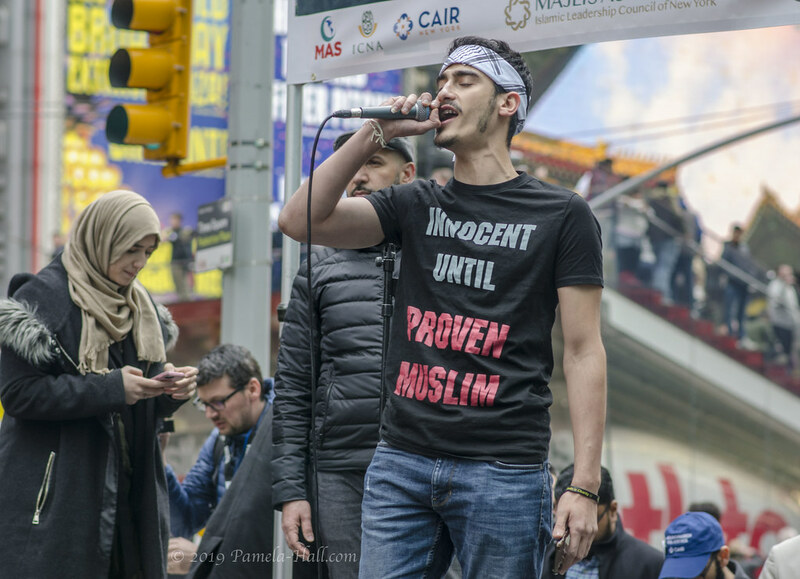 In speech after speech, we were told that Muslims and their supporters are the BEST of humanity. 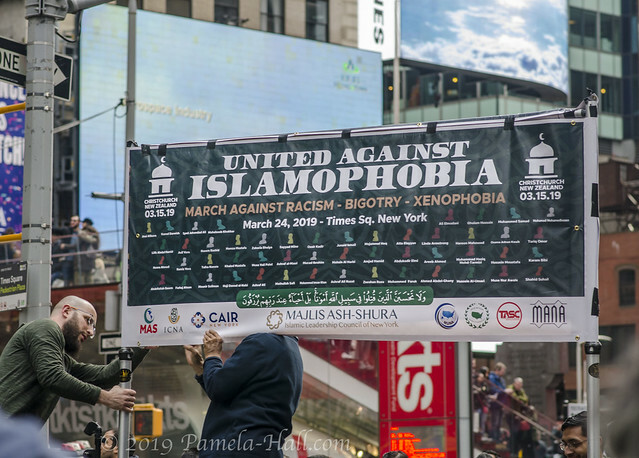 First male Speaker ranted on and on about victims and the so-called war on terror, Islamophobia, anti-black and brown racism and ZIONISM … massacres … Guided missiles fired by racists. 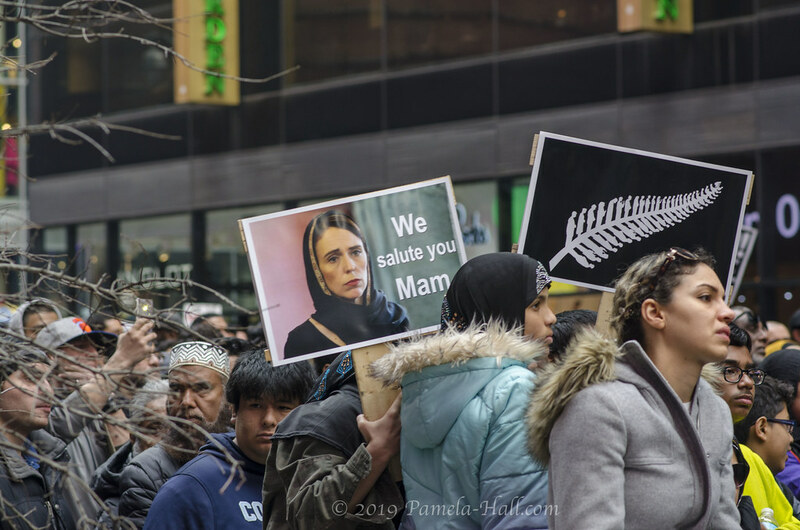 the Victims in New Zealand no different than the victims of the Gaza Freedom March of Return. And before that the 10s of thousands of people of Palestine. The million plus people in Iraq. The 100s of thousands in Afghanistan. All victims of this system of oppression and injustice…we must call out those who commit the crimes AND the powers behind them. 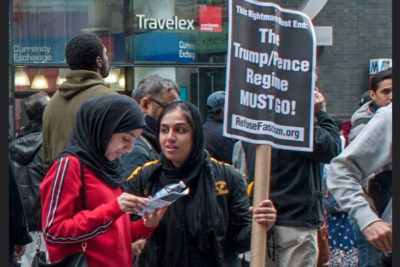 The AIPAC conference … from Palestine to Mexico all the walls have got to go. Second male Speaker: …. 300 million dollars a year to Israel to build walls against Palestinians …. 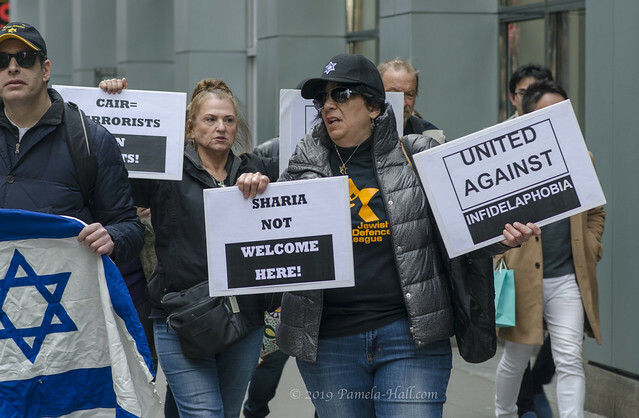 if you support this you are not in solidarity with the Muslim community. 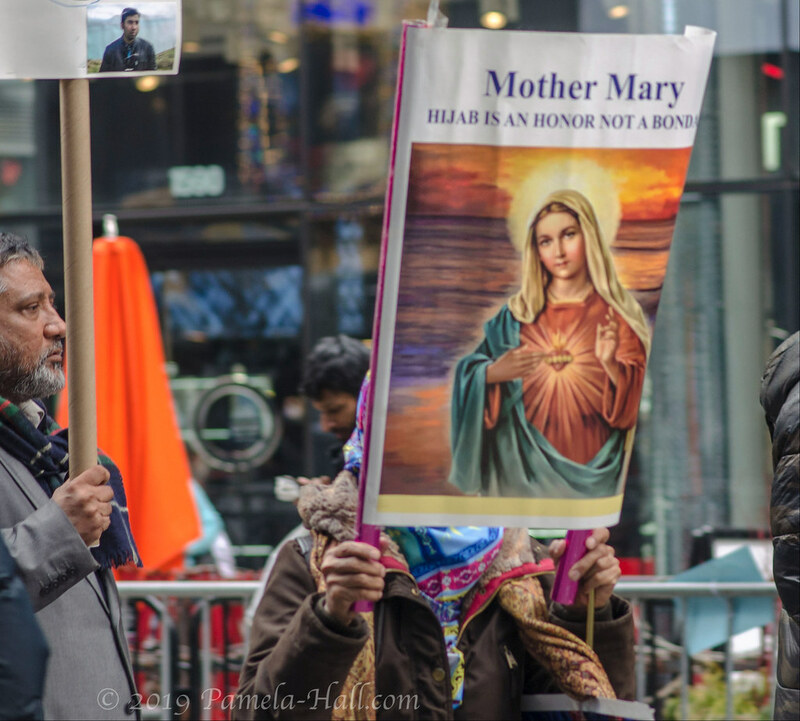 … We are not coming here as peaceful Muslims, we are coming here as Muslims who demand justice. We demand our rights. We demand our god given rights ….. the Constitution … all the oppressed people of the world. We cannot cower. we cannot hide our identity. the people who have spread this bigotry. who are complicit. From the media, CNN. NY Times. who propagate hate. 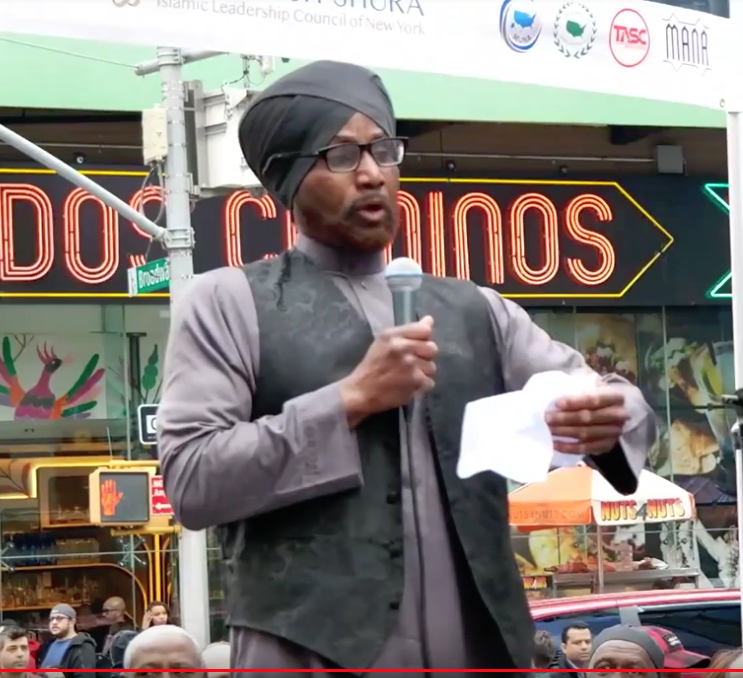 We hear a Muslim prayer to allah, with a look at the crowd and signs; with lots of takbir (allah is greater) – allah akbar (allah is greater) inshallah (if allah wills to happen) and Jalla jalālahu (his glory be glorified) and WE WANT JUSTICE. WE WANT PEACE. 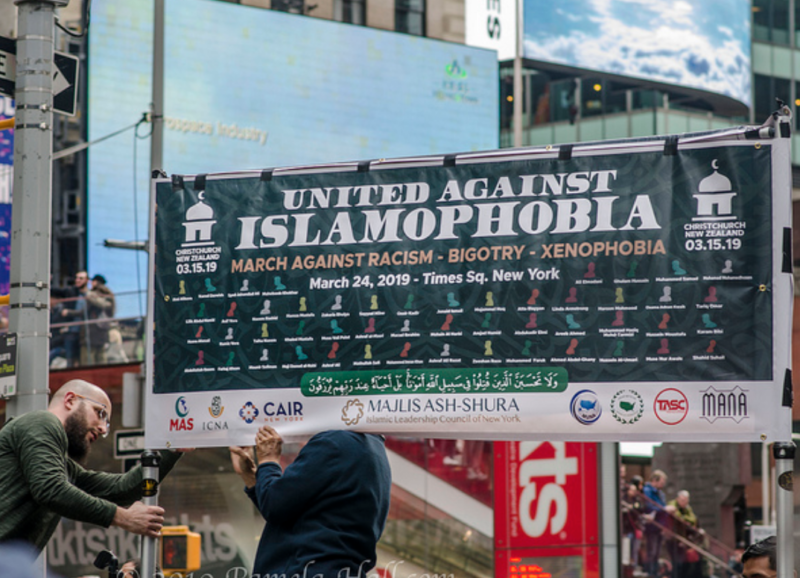 “White supremacy and Islamophobia is an enemy we cannot see. It is something very subtle that happens in our interactions every single day. You have to remember the enemy is the White Man with a gun it is also the institutions that uplifted and empowered that man. It is the media. To allow him a voice. He published before hand what he was going to do, but of course censorship only happens when MUSLIMS want to raise their voices. Morales: “They’re the sickness. They’re sick people. There’s a sickness going on. There’s a group of people that are very sick.” That is what Trump said about Muslims. He gave an O.K. to that murder. Trump said he would very closely look at the closing of mosques in this country. That was an okay to this murder in New Zealand. The Blood is on his hands. On this whole system of Capitalism and Imperialism. He has blood on his hands. 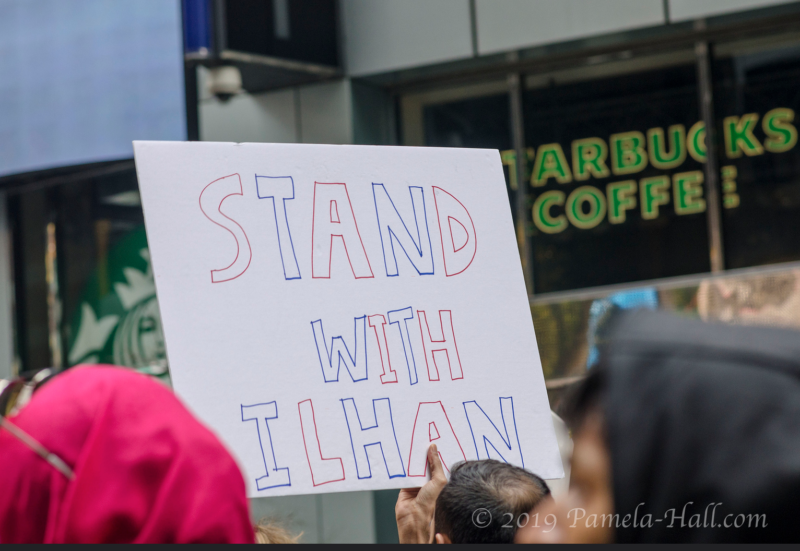 …whether Democrat or Republican who supports Israel. This country was founded on slavery and genocide. They put black people in this country in chains. What kind of system does this? It’s a system that cannot be reformed. A system that must be over thrown. Video 5 & 6 – Speaker 1, a Jeanine Pirro tirade, brotherhood demands change the Constitution. 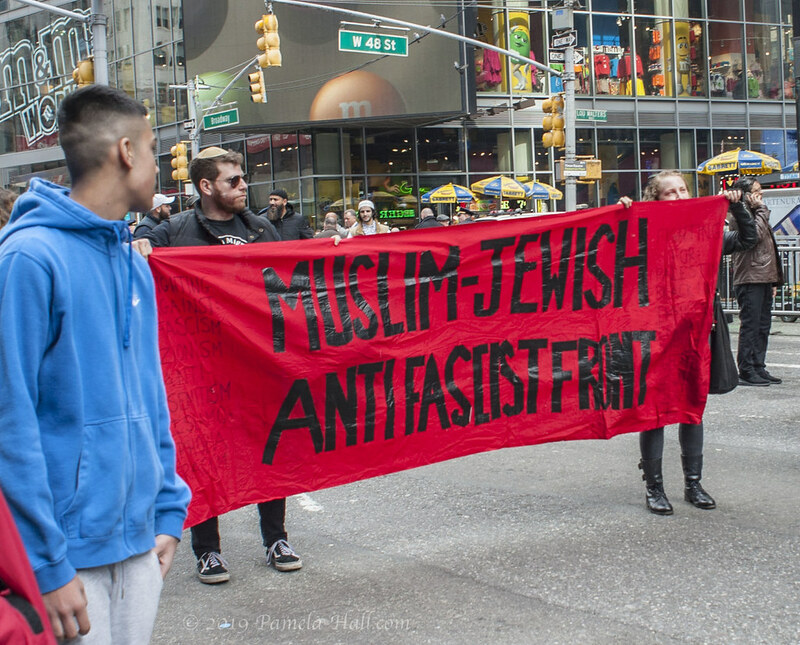 The JDL-NY was there. They managed (against the amplification) to speak the truth over the din. They managed to balance the message. 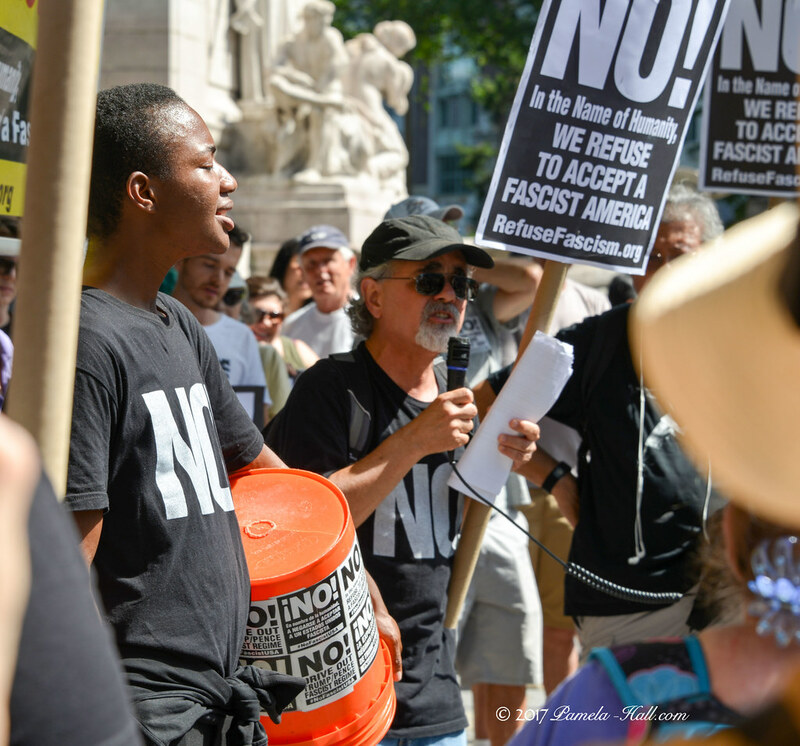 JDL-NY, while marching around the AMPLIFIED protest, was informed by a NYPD legal rep (it’s difficult to HEAR him because the amplified “Say it Loud, Say it Clear” was SO LOUD) that they could not yell. JDL agreed, “They stay in their area, we stay right here.” Not good enough. The NYPD legal accuses them of being combative because they were yelling [unamplified]. He said, the sidewalks would be closed, the JDL moved, if they continued to yell. And then, a very loudly amplified prayer was heard for blocks. 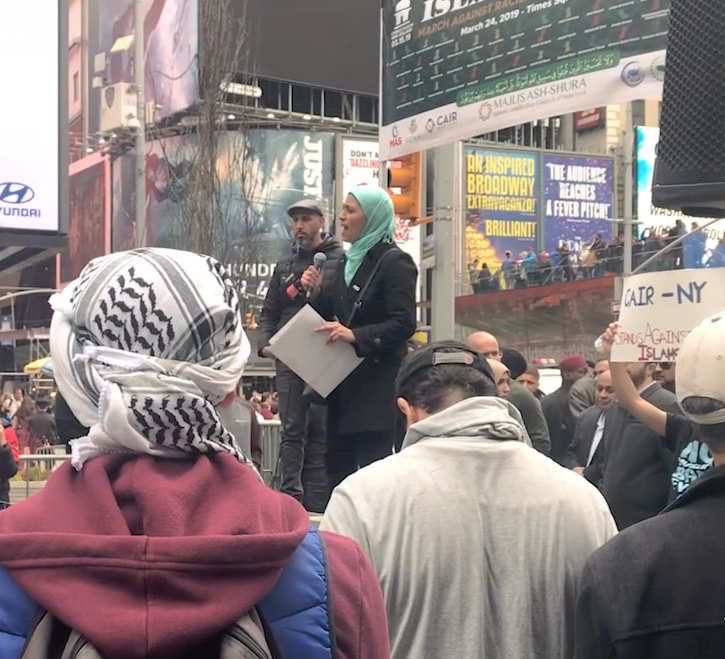 BTW – off camera I mentioned to the officer that the NYPD failed to follow through on these rules at our #CancelSarsour Protest/Rally on May 25, 2017. [Listen to the videos – says it all] Of course, since he claims to have not been there, he can’t address our claim. However, when you look at this picture from May 25, 2017, sure looks like the same officer. Obviously, the rules change depending on who is in charge. 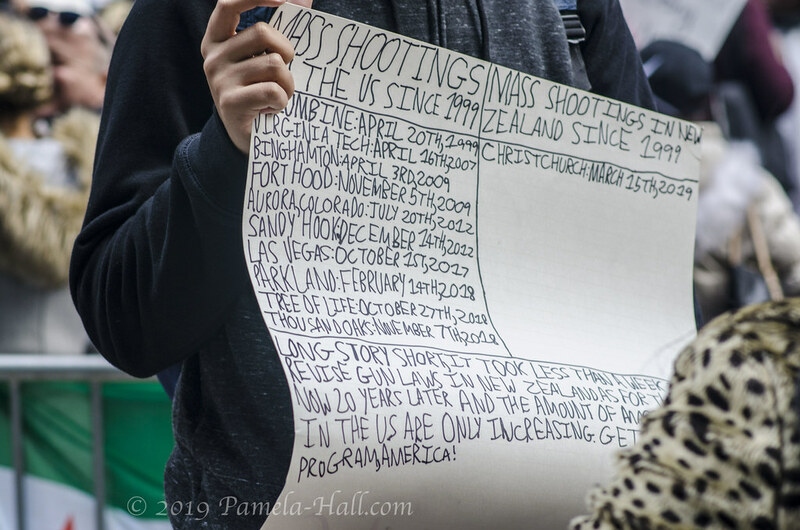 Patriots marching on the sidewalks with signs with unamplified voices. It’s allowed. In NYC, these are the rules: Keep moving. Nothing amplified (FYI- musical instruments, drums, whistles are not amplified). The Left, whenever countering patriots, knows these rules and always marches round and round, chanting and blowing whistles (sometimes not even marching. Just standing still) .We have suffered these offensive actions by the Commies and friends when they wish to rain on our rallies. AND the police LET them. We used to accept being separated by blocks from the rallies on the Left. No more. We, too, now march around. Keep moving and using our unamplified voices to respond to what we see and hear. But, this day we were put ON NOTICE. Our voices were COMBATIVE. If we spoke up, the NYPD would close the sidewalks. If we did not march silently, they would remove us. 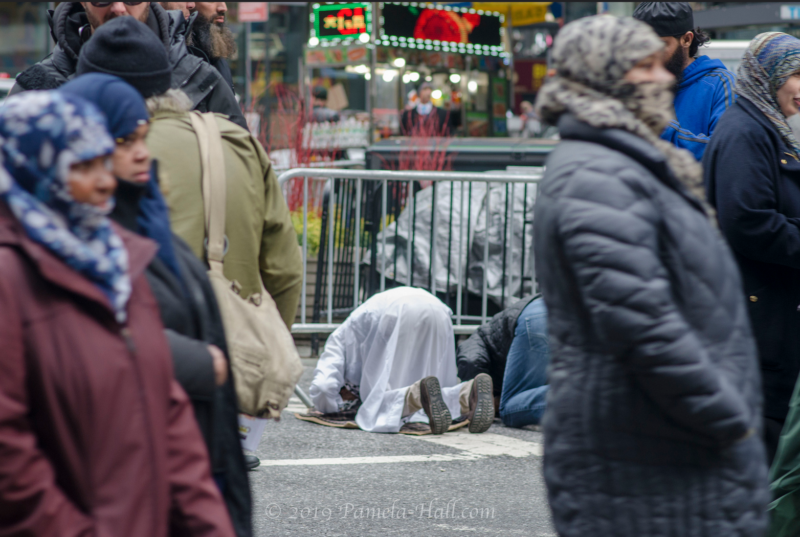 BECAUSE the CAIR rally had the permit which included not just the street but BOTH public sidewalks. 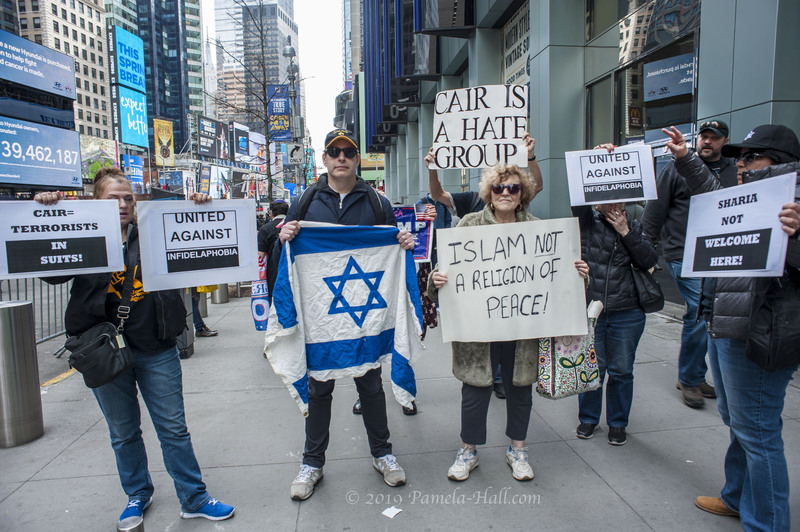 For comparison: see our Geller/Spencer protest against Linda Sarsour . The NYPD did NOTHING to remove the leftists from our staging area. The NYPD – whom we support- sadly, they do not support us.